Use the first paint brush booster to clear the blocks under the pet. Release and use the key to unlock the locked blocks. When you ‘ll activate the rocket use it in the column with the pet at right, to release it from the pet box. Keep clearing blocks till you see the bottom of the screen. Till this point was the easy part of the level. There you have to “drive” the pet in the middle, to the 5th line above the bottom. There you are. Now you have to clear a total column left of it, in order the whole column to be moved one column left. The pet will fall down to the bottom and it will be rescued. Use a paint brush booster there in order to get helped. After that, you can rescue the other two pets either by clearing the blocks under them, or using the rocket booster (that it has been activated since then). 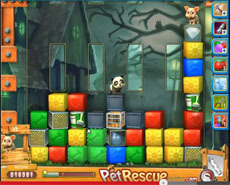 Pet rescue level 352 is quite tricky and can not be completed at first time. Watch our walkthrough video to see the right strategy for it.